Bachelorette winner and trainer Shawn Booth leads a workout class at The Bomb Factory on Feb. 19 as part of CitySTRONG's nationwide tour. Photo courtesy of Zach Harrison Photography via CitySTRONG. Former Bachelorette Kaitlyn Bristowe's DJ set made jump split squats and booty-busting leg lifts bearable and fun. Interactive group workout CitySTRONG, led by Nashville-based trainer Erin Oprea and Bachelorette couple Shawn Booth and Kaitlyn Bristowe, made a stop in Dallas on Feb. 19 at The Bomb Factory. The hour-long session mixed camaraderie with entertainment, with Bristowe in the DJ booth, adding witty commentary between exercises and rapping along to some songs, while trainers Oprea and Booth led the session. The workout was a balance of fun and challenging. The best part: these exercises can be done anywhere—at work or home. 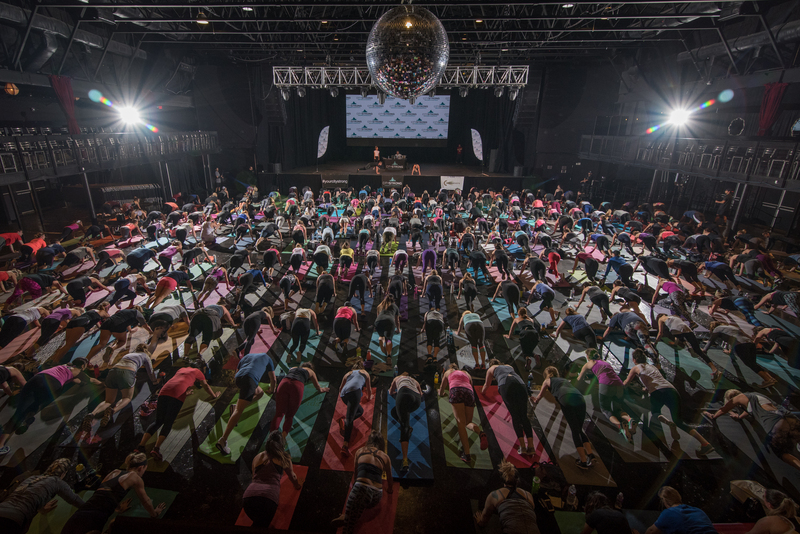 Here are some tips and takes on the new workouts I learned at CitySTRONG’s Dallas stop. I didn’t know my quads could burn for that long. Grab a friend, accept the lunge-off challenge, and drop it low. Not only is it more fun but competition helps push through the burn. Here’s how you do it: While someone holds a deep lunge, the other pulses in their lunge, counting down from nine. Then swap. Next, count down from eight, then seven, and so on. Repeat for the other leg. 3-2-1 pushups will make your guns have guns. Let’s be real. Pushups can be unbearable at times. Try pulsing three times while down in the position to gather momentum for pushing back up. Do this in sets of six and your arms will thank you later, even if they hate you at first. Love handles, the place where weight magically appears and won’t come off. Show ‘em who’s boss with side-to-side plank dips and swivels. Get down on your elbows and assume a plank position. Twist your hips to the left and right, aiming for the ground on each side. Next, start from the full plank position with arms completely extended. Bend the right knee and aim for the left elbow. Do the same for the other side. Perform both movements for one minute. The hour-long session covered everything from pushup intervals to squats. Photo courtesy of Zach Harrison Photography via CitySTRONG. We all dread it, but this 20-second interval workout will lend more results than trudging along on a treadmill or elliptical for an hour. Plus, you’ll combine muscle toning with aerobic exercise. Alternate jump split squats with inner thigh squat bounces. Start with the left foot forward and lunge down, spring up and switch legs so the right foot is in front. Repeat for 20 seconds, then rest for 10 seconds. Get in a wide squat position with your feet turned outward. Jump up and down in this position. Repeat the interval for four minutes. Invest in donkey kicks and leg circles. We all look at fitness models gawking and wondering how­—in this world of carbs—they have a perfectly sculpted booty. Get on all fours and straighten your right leg. Lift it up and circle over to the left side touching the ground with your toe. Then, circle back over to the right side. Continue this for at least one minute and repeat for the left leg. Next, bend the leg and kick back like a side boxing kick for one minute on each side.